Sustainability represents a multi-billion dollar revenue opportunity, along with a healthier and happier existence for us all. sAs offers 7 Simple Steps to Sustainable Business Growth. Stay tuned here for playful, practical and profitable advice every week. Action is the single greatest differentiating factor between success and failure. It's time to act, to wiggle your big toe. Last week in "Step 3: Find Your Sweet Spot," you identified the innovation sweet spot for your organization. Now, how are you going to get there? An effective strategy requires a clear plan of action. So now it's time to backcast from that sweet spot into action. 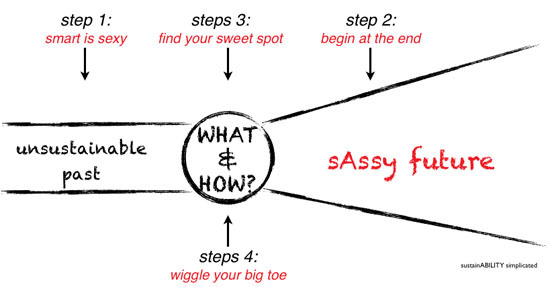 Imagine you have arrived at your future Sweet Spot, your sAssy future. How did you get there? What specific steps did you take on your way? Think about your first year of action toward that sassy future state. What 12 action steps can you spread across those first 12 months? Write those down in the template below. Action: Download this 12-month MAP (Massive Action Plan) template and place one goal in each month to make your plan digestible and realistic. Then identify the exact steps to achieve the goal for the current month: What steps do you need to take each week to ensure you reach your end-month goal? Cool. Now, get to work. Please leave a comment below telling us about your first MAP goal and what action steps you're taking today to make it a reality. If you've missed any of the previous steps in this series, you can find them here. Cortney McDermott and Suzanne Pinckney are the co-founders and owners of sustainABILITY simplicated (sAs).